IUGR is Intrauterine Growth Retardation or restriction in which fetal growth is restricted. SGA is a Small for Gestational Age fetus or infant; smaller than 10% of all individuals at that gestational time period. IUGR is intrauterine growth retardation or restriction, and it is the condition in which the growth of the fetus in the uterus is poor and restricted. The key feature of IUGR is the appearance of a malnourished infant at birth regardless of their size. A fetus with IUGR will often be smaller than usual for its age of gestation in utero, but regardless of how much smaller they may be in size, these infants will look malnourished when born and the head may appear larger than normal compared with the rest of the body. These babies also often have dry and loose skin, a small abdomen and the umbilical cord appears thin and small in size. Some children have Russell-Silver Syndrome which is IUGR resulting in specific features such as having a large head, and a triangular shape to the face. A fetus that has IUGR can be detected by the doctor measuring the distance between the fundus of the uterus and the pubic bone. The value obtained should be in accordance with the gestational time period that has passed and should fall within a specific size range. If the value is lower than expected then IUGR may be suspected. Doppler can be done to measure blood flow in the uterine arteries and if these values are reduced, then IUGR may be present. 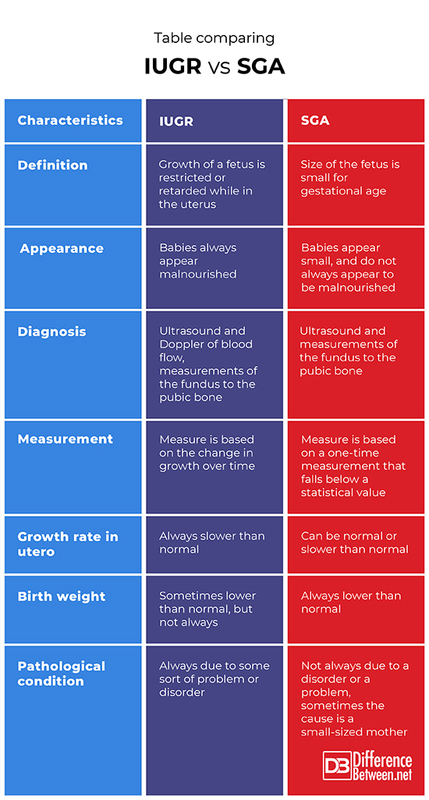 Ultrasounds taken over a period of time can be done to measure the size of the baby’s abdomen and head and compare these with normal growth measurements for the particular weeks of pregnancy that has elapsed. Only measurements taken over time can indicate abnormal growth patterns. Small growth values and low amounts of amniotic fluid can indicate IUGR. There is an increased mortality rate of fetuses and babies that have IUGR, and many of the complications depend on the cause of the condition. 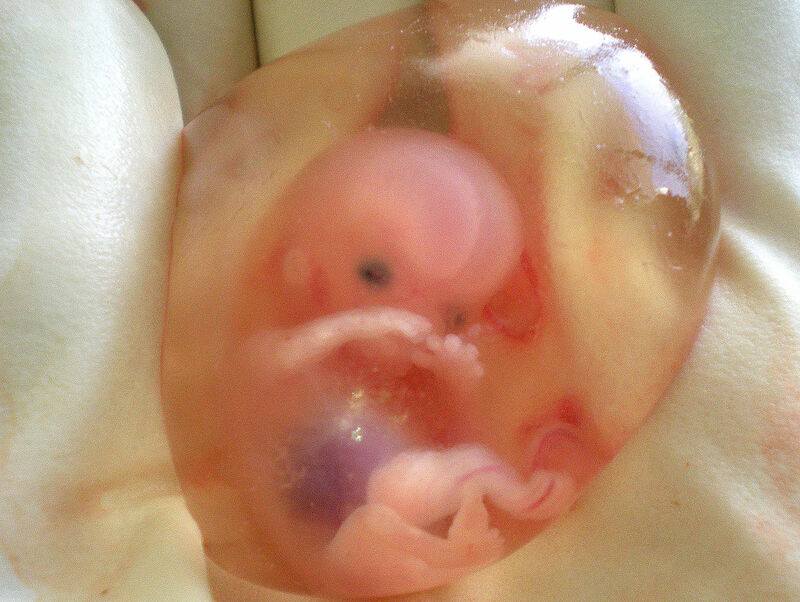 Some fetuses may die in utero from the condition. At birth, the IUGR infant may aspirate meconium or experience perinatal asphyxia. They may also have hypoglycemia or hypothermia. Jaundice and polycythemia may also occur at birth. The treatment of the condition depends on the cause of IUGR, and at birth the baby can be treated to correct any complications due to the condition. It is, however; better to prevent IUGR from happening. This means that the mother needs to follow a healthy diet, not take drugs or abuse alcohol and avoid becoming ill with infections that could cause the condition. 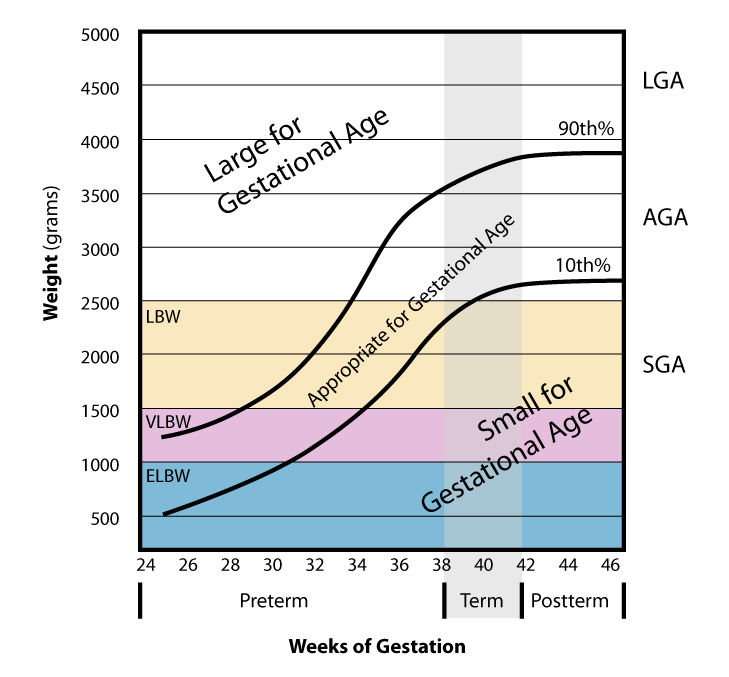 SGA is Small for Gestational Age and describes the condition in which the size of a developing fetus is below normal (less than the 10th percentile) or two standard deviations below what is average, for their age of gestation. Physically these infants when born appear to be normal in appearance except for appearing thin and having little fat and muscle tissue. Sometimes the face can appear somewhat sunken. The umbilical cord may also often not be thick or large but appears smaller than normal. The condition of SGA in a fetus is best diagnosed using a combination of clinical measurements and ultrasound measures of fetal size. Measurement of size from the fundus to the pubic bone should be done on the mother. An ultrasound can show the size of the head, abdomen and entire body. These various measures can then be compared with the time of gestation and if the value falls below 10% of what is expected for that time of development, then SGA can be confidently diagnosed. There are many reasons for a baby to be SGA. An SGA fetus or infant can result because of IUGR, but not always. A baby may be SGA if the mother smoked, drank or did drugs during the pregnancy. Uniparental disomy and other chromosomal abnormalities in the fetus can result in SGA. An abnormality of the uterus and malnutrition can also result in a small for gestational age infant. Illness in the woman such as diabetes, hypertension or kidney disease can also produce an SGA infant. Some causes though, are not pathological, for instance, an SGA baby may result because the mother herself is small in stature. The complications present in an SGA baby are similar to those of an IUGR infant. Problems such as meconium aspiration or asphyxia can occur at birth, especially if the SGA is due to IUGR. Other complications that may arise include polycythemia and hypoglycemia. Hypothermia may arise at birth as well due to the child being SGA. Supportive care is given to the baby who is born SGA, and any complications are treated accordingly. Although not all causes can be prevented, the best approach to try to prevent the condition is for the mother to stay healthy and to keep doctor’s appointments while pregnant. Difference Between IUGR vs. SGA? IUGR is when the growth of a fetus is retarded or restricted in utero. SGA is when the fetus is smaller than normal for its gestational age. In IUGR the babies always look as though they have been malnourished. In SGA, babies do not always appear malnourished. An IUGR fetus is diagnosed by measurement, ultrasound and noting Doppler flow through the blood vessels. An SGA fetus is diagnosed by measurement and ultrasound. IUGR is based on more than one measurement to indicate growth patterns. SGA is based on one measurement taken at one point in time. A fetus with IUGR always shows slower than normal growth in the uterus. An SGA baby does not always show slower than average growth. The birth weight of a baby with IUGR is not always lower than normal, but the birth weight of an SGA baby is always lower than normal. The IUGR condition is always pathological; it is always due to a problem in utero. The SGA condition is not always due to a problem and may be due to a very small size mother. IUGR is a condition of limited growth of a fetus in the uterus. SGA is a smaller than usual size of a fetus or baby when compared with statistical norms. Both IUGR and SGA can have similar complications once the baby is born, such as hypothermia or hypoglycemia. SGA is not always due to a problem or pathological process but IUGR is always indicative of an underlying problem. What is the difference between gestational age and fetal age? Dr. Rae Osborn. "Difference Between IUGR vs. SGA." DifferenceBetween.net. March 18, 2019 < http://www.differencebetween.net/science/health/difference-between-iugr-vs-sga/ >. Cyrkowicz, A., and A. Czekański. "Intrauterine growth retardation (IUGR) vs small for gestational age fetus (SGA). Diagnostic aspects." Ginekologia polska 69.4 (1998): 213-217. Sharma, Deepak, Sweta Shastri, and Pradeep Sharma. "Intrauterine growth restriction: antenatal and postnatal aspects." Clinical Medicine Insights: Pediatrics 10 (2016): CMPed-S40070.